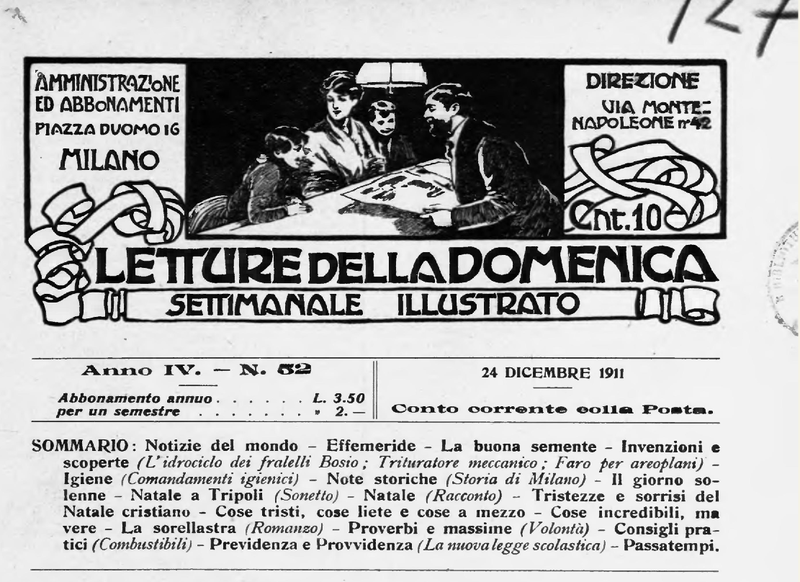 A hundred years ago, on Christmas Eve 1911 the Milanese weekly Letture della Domenica. 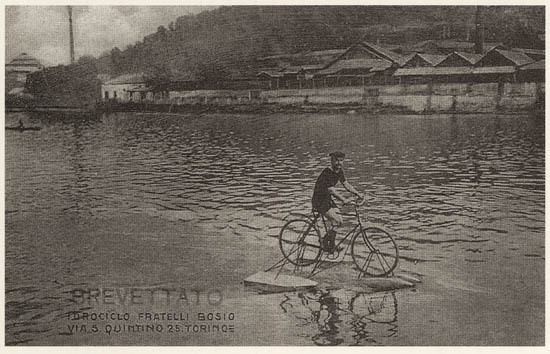 Settimanale Illustrato gave news that finally, after many failed attempts, thanks to the genius of two brothers from Turin, it was possible to cross any river or lake without getting off the bike. We are surprised that the news was unveiled at a date when it was so cold on the banks of the Po. Obviously, given the importance of the technological achievement, the Bosio brothers could not wait until the arrival of good weather to spread the good news. “The idea of transforming a regular bike into a floating vehicle able to navigate on the water, so that the rider, after following our public roads, could also cross a river or a lake, has tempted many experimented mechanics, without any of them having been able to beat the real difficulties of pedaling on the too unstable waterways. 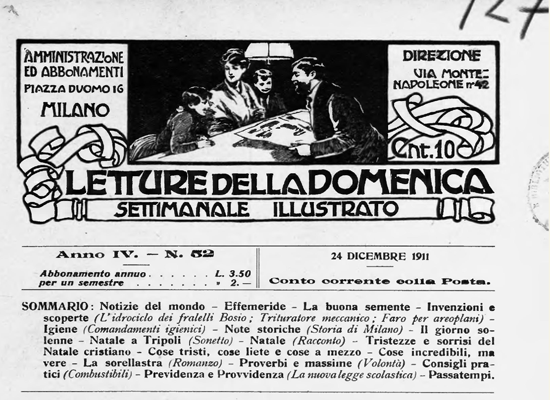 Now the brilliant victory, as it was shown, was achieved by two inspired but modest Turin workers, the Bosio brothers. The device consists of three floats attached to the bike with their respective tubes and steel straps; the first under the front wheel provides the function of steering, while the other two, on the two sides of the rear wheel, are linked together so that they keep the bicycle on the water. 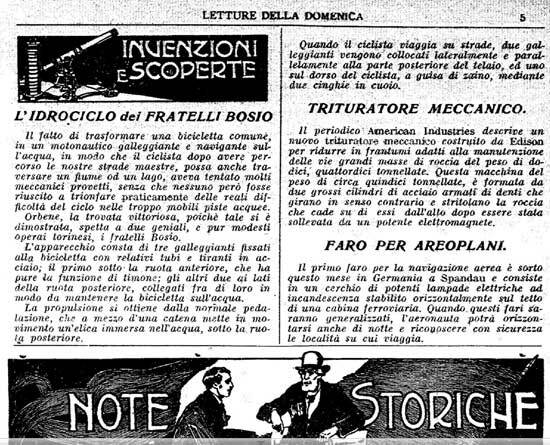 We have been in Turin a couple of times, but, unfortunately, we have never seen any example of the device of the Bosio brothers in work either upstream or downstream the Po. well, I'm looking at the Po right now, near the same place in the picture (you can see the Gran Madre di Dio cupola in the backround) but no hydrocyle at all. In 1929, M.lle Pfanner crossed the English Channel from Calais on a hydrocycle; who knows if the Bosio brothers were there themselves?